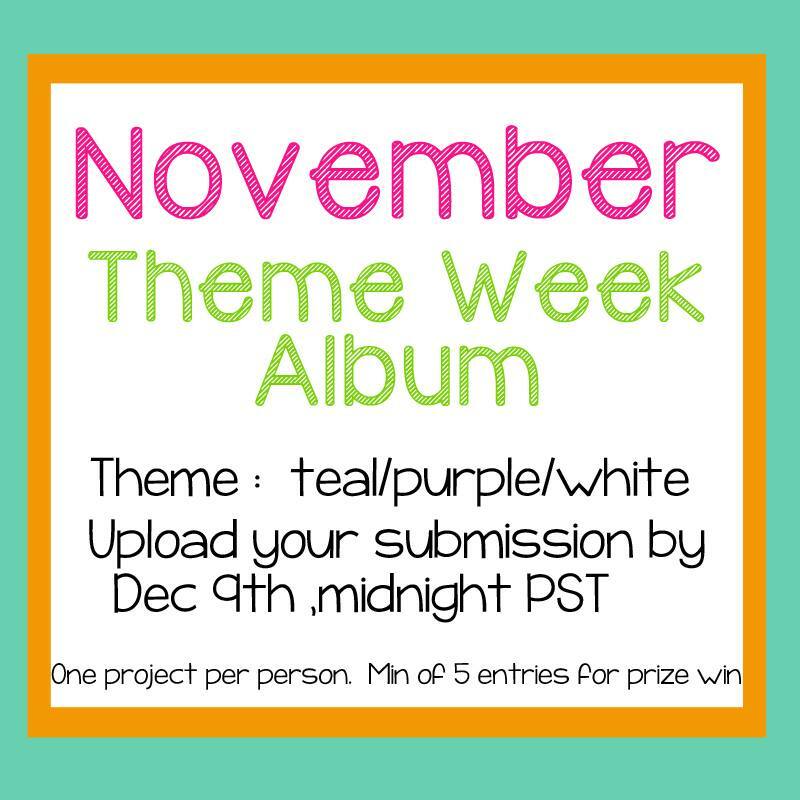 Make ANY project with Teal, Purple, and White colors! I used the Annie-Warm and Toasty stamp set for my Theme Week card. 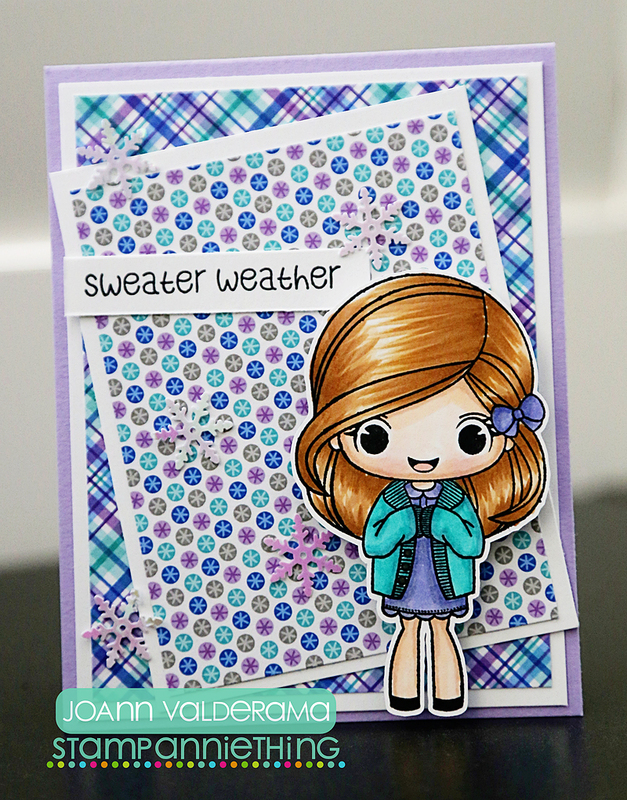 I added the strips to the background cut with the Panel Dies and the white mat cut with the Rectangle Dies 2. 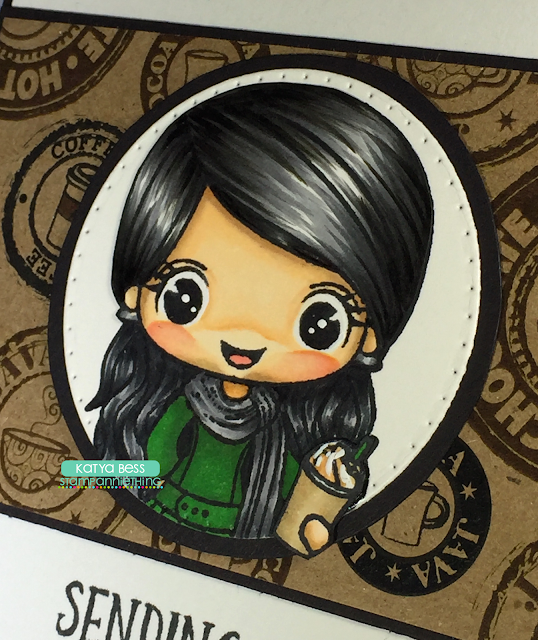 I stamped and colored Annie with Copic Markers and pop dotted her to the mat. 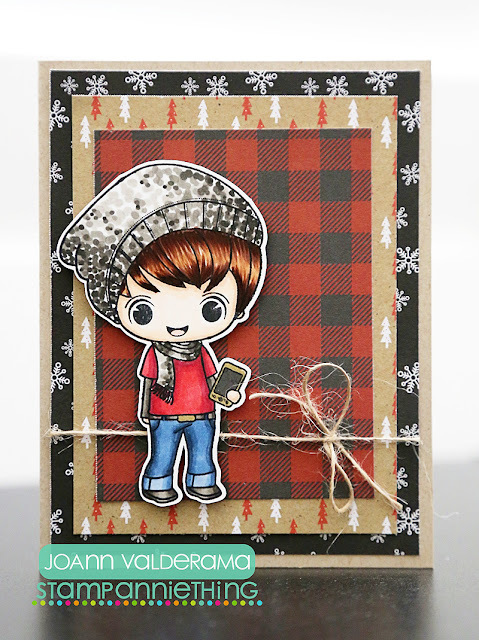 To finish, I heat embossed the sentiment at the bottom and added a decorative die cut to the side. Sweet Treats for the sentiment. Hello! Melissa from Doxie Mel Designs with you today. I have a new card made with the "Holly Sweet Dreams" stamp. I just love her bunny slippers. I had a pair myself but I always tripped over the rabbit heads. hehehe Holly is colored with Copic Markers and her pajamas are paper pieced. 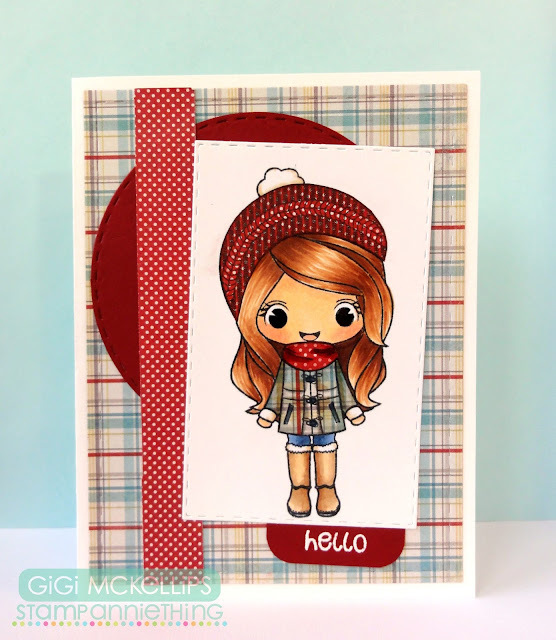 The yummy plaid paper is Lawn Fawn's Perfectly Plaid. And I want to tell you about the Sale at Stamp Anniething! Annual Black Friday sale on Friday November 25 through Cyber Monday the 28th. Happy Shopping! 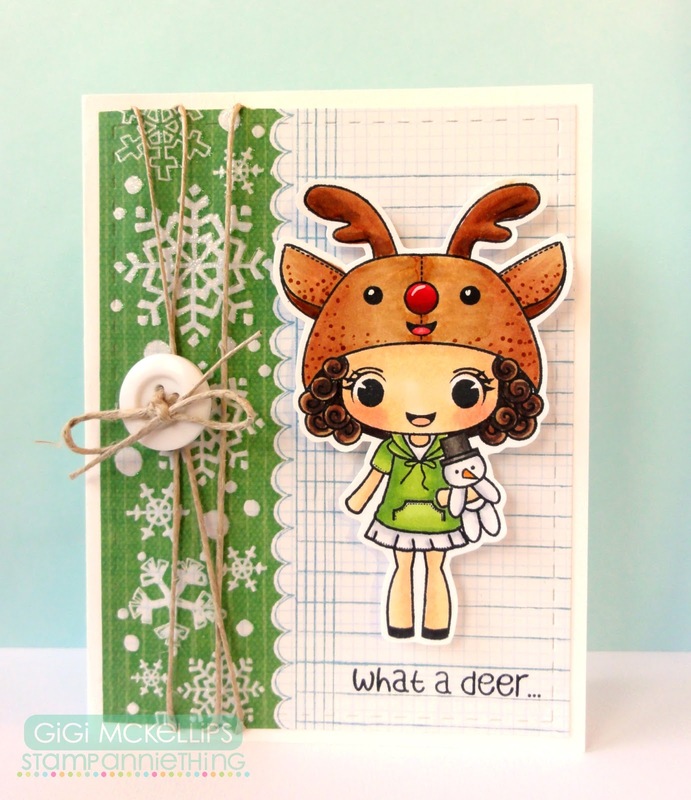 I used the Lucille-What A Deer stamp set for my card. 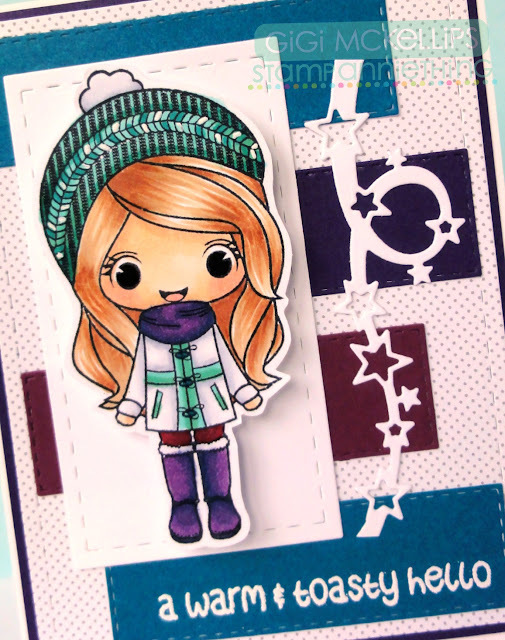 I stamped and half paper piecced/half colored Lorraine onto a mat cut with the Goody Bag Die. I added a die cut heart strip to the background and added Lucille on pop dots. 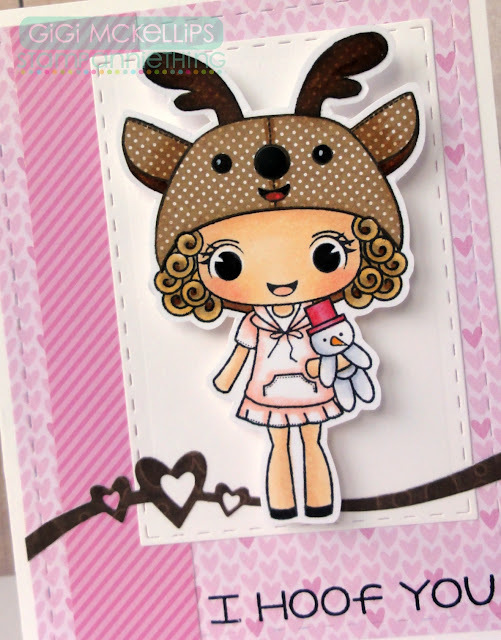 To finish, I stamped the sentiment from the Hello Deer stamp set. 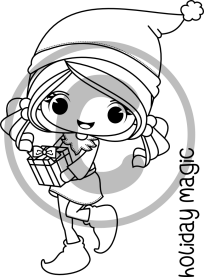 For today I made a tag to add to a gift for a friend of mine!!! I used Luggage Tag Dies for the tag, the Merry & Bright for the sentiment. Hi! It is Melissa from Doxie Mel Designs with a new card, I just love the stamps from our last release. I colored up Paige in blues this time. The image was stamped in Cocoa Brown lightly and colored with Copic Markers. Her eyes were darkened with color pencils. I added some snowflakes cut with dies from Jaded Blossom. 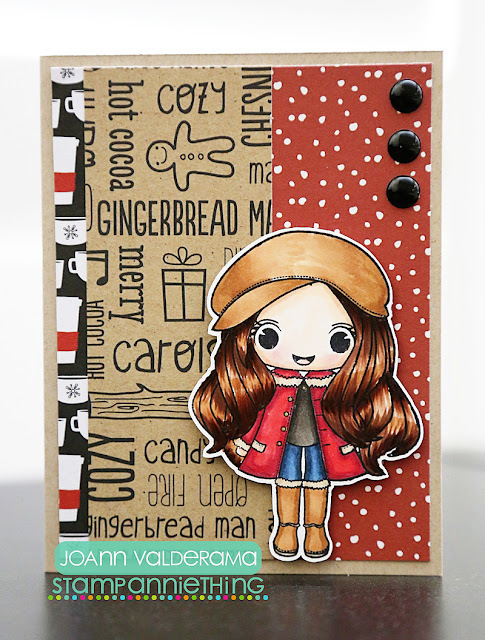 JoAnn from JoBoogie Stamping here with a new card to share with you today! The weather is cooler and it's time to bundle up in boots, scarves, hats and sweaters! It's starting to become one of my new favorite times of the year! 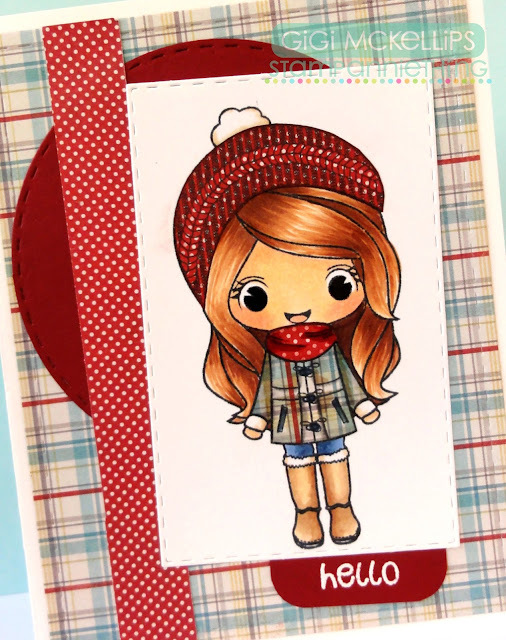 I used the Annie-Warm and Toasty stamp set for my card. I added a strip to the side and a circle to the background cut with the Stitched Circle Dies. I stamped and colored Annie onto a mat cut with the Goody Bag Die and added it to the card. To finish, I hand cut a sentiment banner and heat embossed the sentiment using the Lorraine stamp. Katya Bess, here I hope all is well. 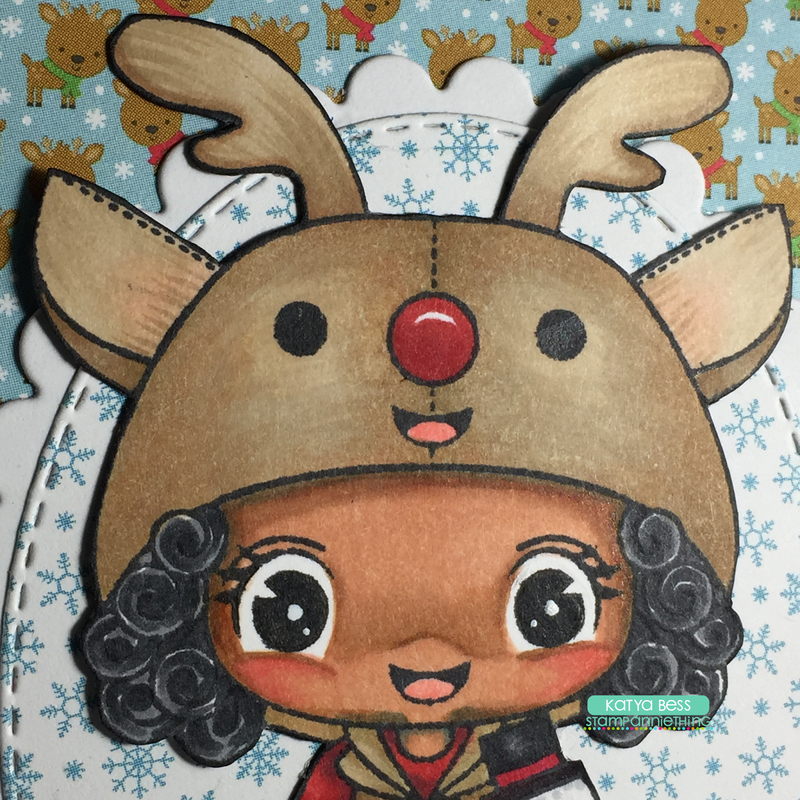 I've been working on some Christmas coloring and decided to share this card I made with Lucille - What a Deer, she is one of my favorite Chibi Kids to color from Stamp AnnieThing. On one of my previous posts I decided to color her as a red head with cute little freckles and this time I'm coloring her as an African-American with sort of medium tone. 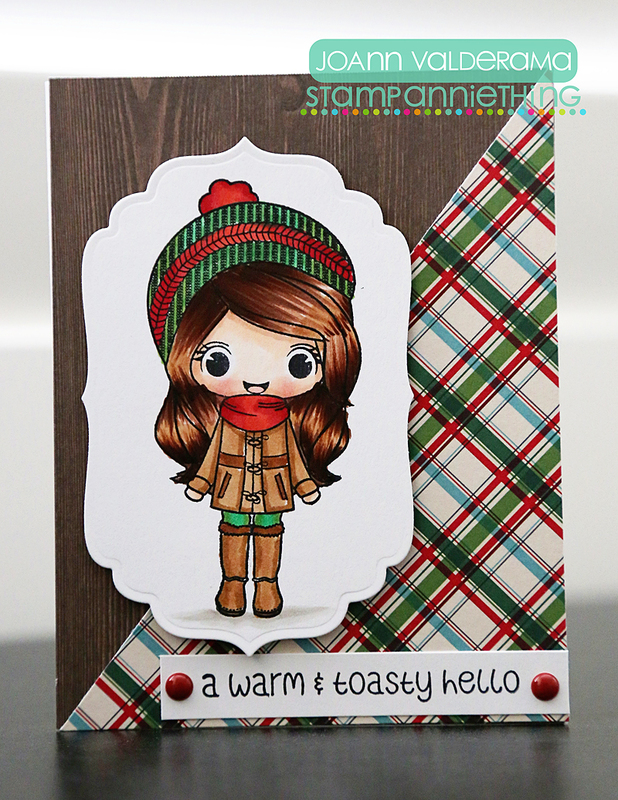 the DoodleBug Design: Sugarplums 6x6 paper pad. Hello! Melissa from Doxie Mel Designs with a new card for you today. I colored up one of the cute Chibi Kids called Melanie Need a Hug with Copic Markers. Melanie's dress was paper pieced with a red polka dot paper. Be sure to stop by my blog for more info and pick up your very own James here! Thanks so much for stopping by! Have a wonderful week! 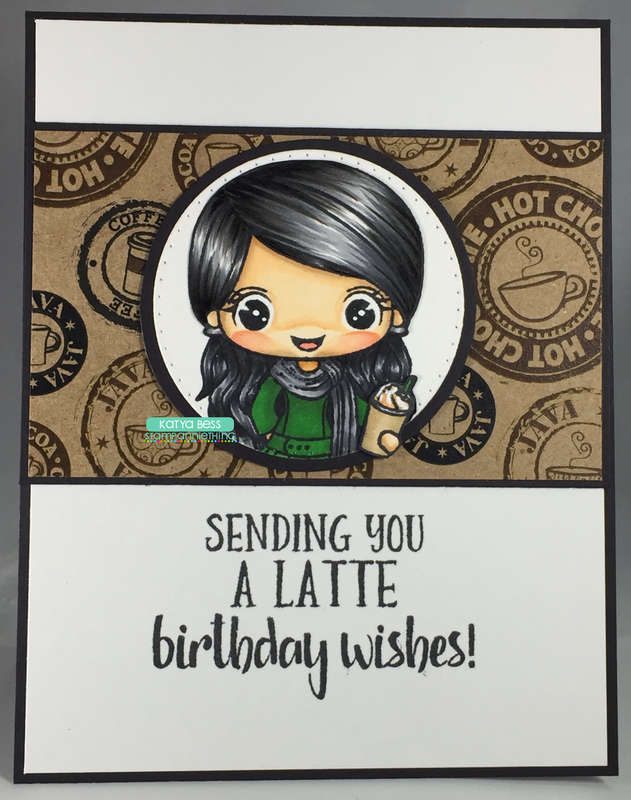 I used the Sam-Best Buds stamp set for my card. 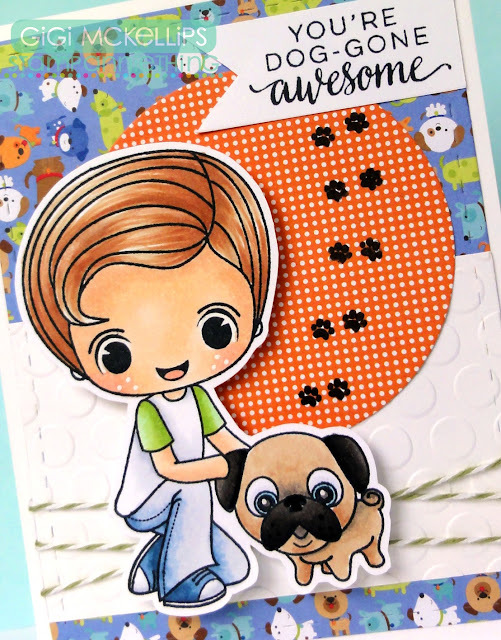 added a die cut circle to the background that I stamped with paw prints from the Dog-Gone Awesome stamp set. I stamped and colored Sam with Copic Markers and added him to the card on pop dots. To finish, I tied some twine around the center and stamped the sentiment from the Dog-Gone Awesome stamp set onto a hand cut banner. This isKatya Bess from KattyXotica's Kreations, I'm latte! I'm latte! I'm latte for a very important date.... LOL Today I have a coffee themed birthday card for you... it's a little belated birthday card. I'm thinking I need to make more of these (when I get time) with different skin tones and different hair colors and just have them ready for when I forget a birthday or just cause I'm busy. ha! I found this coffee themed 12x12 paper at Michael's and I had a few coffee cards for friends and teachers in mind but I love how clean and simple this one looks. I just traced around the die and cut with scissors. white is 65 lb I like to use for simple layering. Anyway, I hope you liked my card. 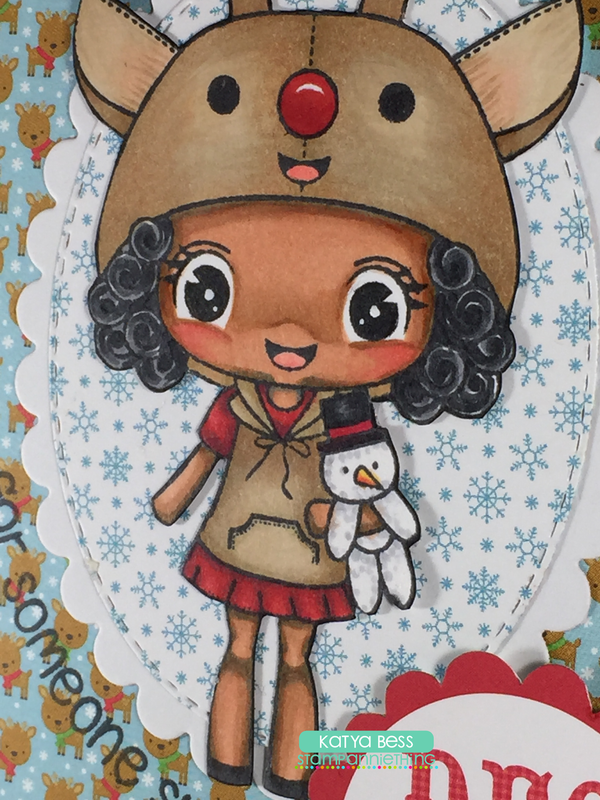 November Release Day #3 - Lucille What a Deer! 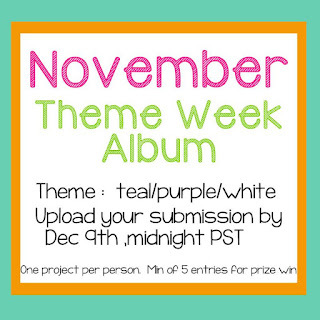 We hope you enjoyed our November release! Check out the AWESOME creations the Design Team made with Paige!